Welcome to BHM Corporation. 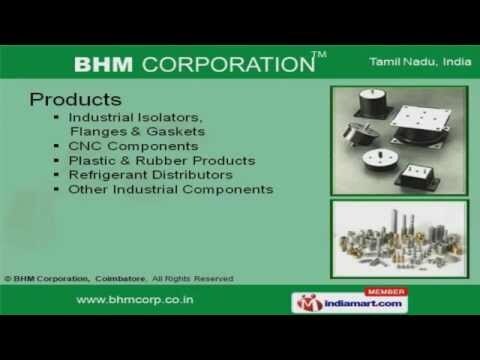 Manufacturer and Exporter of Industrial Products and Components. The company was established in the year 2003, at Coimbatore. We have received The International Trade Awards 2006-07 Organized by CNBC TV 18 and DHL and we Export to Europe and Middle East. Rigorous quality checks, Specialized R and D wings and Capacious warehousing facility are the plus points of our organization. We offer a huge gamut of Industrial Isolators, CNC Components and Refrigerant Distributors. Our Industrial Isolators, Flanges and Gaskets are widely acclaimed in the market. We also provide CNC Components that are best in the industry amongst others. Our Plastic and Rubber Products are cost effective. We are engaged in offering a wide range of Refrigerant Distributors that are a class apart. Our Copper Spuds, Striker Nuts and Industrial Spindles are available under Other Industrial Components.